This is a lovely dish that really showcases how beer and Asian flavours can work incredibly well together. The combination of the sweet, dark beer and the palm sugar against the salty soy sauce and spices makes for a beautifully balanced dish. 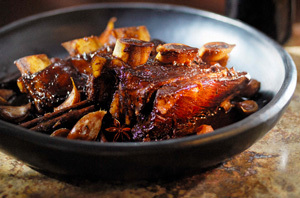 Place the ribs and dark soy sauce in a glass or ceramic dish. Mix with your hands to coat the meat in sauce. Cover and refrigerate for at least 30 minutes. Heat the oil in a deep, heavy-based saucepan over medium heat and fry the garlic cloves for 1 minute. Add the cinnamon and star anise and fry for another minute. 2–3 hours or until the meat is literally falling off the bone. Using a slotted spoon, carefully remove the ribs from the pan, aiming to keep the pieces intact. Simmer the cooking liquid over high heat until thickened and reduced by about three-quarters. Return the beef to the pan and heat through. To serve, divide the ribs and garlic cloves among 4 plates. Drizzle with the sauce and offer steamed jasmine rice on the side. Perfect beer match: Dunkel, Belgian Dubbel. From The Entire Beast: From Ear and Beer to Ale and Tail, by Chris Badenoch. Published by Penguin, RRP $39.95.